The “Alice Books”—Alice in Wonderland and Through the Looking Glass and What Alice Saw There may have their hidden meanings and puzzles which one may need an annotated edition to figure out, but one of my favourite things about these books, which never fails to delight even a casual reader like me, is Lewis Carroll’s play on words—his use of alternative meanings, pronunciations, and sounds to make the narrative humorous. One of the funniest instances of Carroll’s “wordplay” in these books is “The Mock Turtle’s Story” where the Mock Turtle and Gryphon relate to Alice, their experiences at school in the sea. Their school master was called “tortoise”, for as they said, “he taught us (‘ˈtɔː(r)təs’)”. And the subjects they studied included Reeling and Writhing (Reading and Writing), Mystery (History), Seaography (Geography), and Drawling (Drawing) with the classical master teaching them “Laughing and Grief” (Latin and Greek). One can only imagine what the different branches of arithmetic would have contained—“Ambition, Distraction, Uglification, and Derision”, lessons that people unfortunately know even if not “taught” in school. “Lessons” in the sea, as they are pronounced, “lessen” from day to day, “ten hours the first day…nine the next and so on”. Other facets of life under the sea are equally amusing with boots and shoes being made of “soles and eels” and done with the “whiting” (why else would it be called that, after all?). And in this world, “no wise fish would go anywhere without a porpoise (purpose)”. Of course, life on land in Carroll’s world is no less fun with even a mouse bringing a smile to our face, when trying to help Alice and the others drenched by the pool of her tears, by giving them “the driest thing”, he knows—a lecture on William the Conqueror. The “Live Flowers” in Looking Glass world aren’t ever frightened at being outside alone for they are protected by the tree in the middle, which can “bark” and say “bough-wough” (why else would its branches be called “boughs”?). They can talk unlike other garden flowers since their “beds” are hard; were their beds “soft” like ordinary garden flowers, could they do anything but sleep? 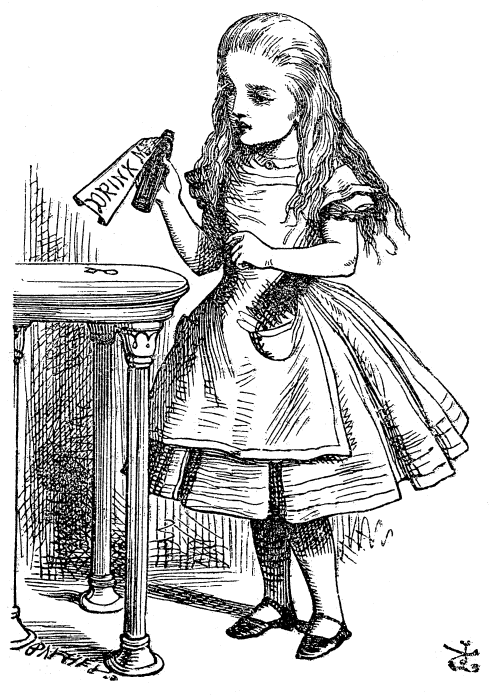 At one point in Through the Looking Glass, Alice remarks, “The question is…whether you can make words mean so many things?” As we see in these books, Lewis Carroll certainly can, and does so with great wit and humour. I’ve always loved the play on words in “Alice”, and you’ve really brought out some of the very best─ many of which I had completely forgotten. But, what about the visual imagery? It really lifts the book into the realms of fantasy. Remember how the story begins on a summer afternoon with the bored Alice peeping into her sister’s book in the hopes of finding something interesting, but to her dismay there are neither pictures nor conversations, “and what is the use of a book” thought Alice “without pictures or conversations?” Now cut to the mouse’s tale (should I say “tail”?). “’Mine is a long and sad tale” said the mouse”. .. Alice looks down with wonder and agrees that it is certainly long, but why “sad”? great piece for language teachers. we have lost the humour somewhere since the communication oriented language teaching became the norm!!! Thanks for reading aunty! Glad you enjoyed it. I agree – not just language but I think most things have become like that today. We are taught to look at them from the point of view of utility and not so much to appreciate them for what they are. I agree with Nira above. Toenail’s drawings are as iconic as the wordplay from Lewis Carroll. I’ve always been a fan of wordplay to get my dose of humour. It’s why Alice can never fade, it’s why I like PG Wodehouse too. So true. Alice is something I find myself enjoying more with each read. There’s always (so far) something that I find that I’d never noticed before and it never fails to amuse. And I haven’t even gotten started on its hidden meanings- the maths and the “death jokes”. Through the Looking Glass apparently is fully playable chess game. ….